Kingbird (позже Model 55) - двухмоторный подкосный высокоплан, рассчитанный на перевозку от пяти до семи пассажиров. Инженеры "Curtiss" использовали в конструкции одну особенность - установили два звездообразных мотора как можно ближе друг к другу, так что ДальшеMore>>> круги вращения винтов почти соприкасались перед короткой носовой частью фюзеляжа. Позже эта особенность будет встречаться на многих самолетах других фирм, так как несколько снижает проблемы компенсации асимметрии тяги в полете с одним работающим мотором. Прототип Kingbird С выполнил первый полет в мае 1929 года с двумя моторами Curtiss Challenger мощностью по 185 л.с. За прототипом последовали два Kingbird D-1 с моторами Wright Whirlwind J-6-7 по 225 л.с. Авиакомпания "Eastern Air Transport" заказала И серийных Kingbird D-2; два D-1 доработали в D-2. Единственный Kingbird D-3 поднялся в воздух летом 1931 года с двумя 330-сильными моторами Whirlwind J-6-9. Модернизацию провели прежде, чем были собраны первые три Kingbird. Kingbird С стал Kingbird J-1 с моторами Whirlwind J-6-7 мощностью 240 л.с; первый Kingbird D-1 - Kingbird J-2 с моторами Whirlwind J-6-7; второй Kingbird D-1 превратился в Kingbird J-3 с 300-сильными моторами Whirlwind J-6-9, который использовался для перевозки почты. Один Kingbird закупила морская пехота США в 1931 году как транспортный RC-1. Если не считать некоторых доработок под их требования, он представлял собой обычный восьмиместный Kingbird D-2. Силовая установка: два звездообразных поршневых мотора Wright Whirlwind J-6-9 мощностью по 300 л.с. WE give below a brief description of the first 1930 development in aircraft design of the Curtiss-Wright Corporation - the "Kingbird," produced by the Curtiss-Robertson Airplane Mfg. Co., of St. Louis. The Curtiss "Kingbird" has been developed as a passenger carrying aeroplane of medium size, economical in , first cost and operation, but having all the advantages of the larger transports in comfort and multi-engined safety. Such a machine is exactly what is needed today for feeder lines, for sightseeing, and for transport lines on which the traffic does not justify the use of the larger ships. From a design standpoint, the history of the "Kingbird" really goes back to the famous "Curtis Robin," the "Robin," the new six-place "Thrush," and now the twin-engined "Kingbird," all high-wing cabin monoplanes, are similar in their general plan of construction. In developing this line of ships the Curtiss Aeroplane and Motor Company has spent over $500,000 in engineering and research at its laboratories and experimental factory at Garden City, Long Island. This expenditure of time and money by the Curtiss engineering staff has given the "Kingbird" that degree of aerodynamic and structural quality that has always been maintained in Curtiss aeroplanes. 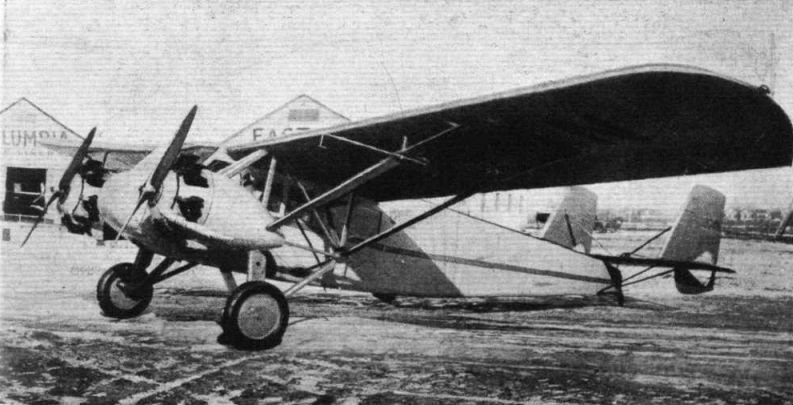 Briefly described, the "Kingbird" is a high-wing, externally-braced monoplane powered by two Wright Whirlwind air-cooled engines, J-6 series, mounted in outboard nacelles beneath the wings. Since there is no engine in the nose of the fuselage, vibration, noise and petrol fumes are kept away from the cabin. Another advantage resulting from this power plant arrangement is that the pilot has unobstructed vision. The two Wright Whirlwind engines of 225 h.p. each give the "Kingbird" an ample reserve of dependable power and a fine performance. With full load, the ship can cruise at better than 115 m.p.h.. has a service ceiling of 14,700 ft., and climbs 900 ft. per minute; it can fly on either engine, thus reducing the hazard of having to make a forced landing to a minimum. 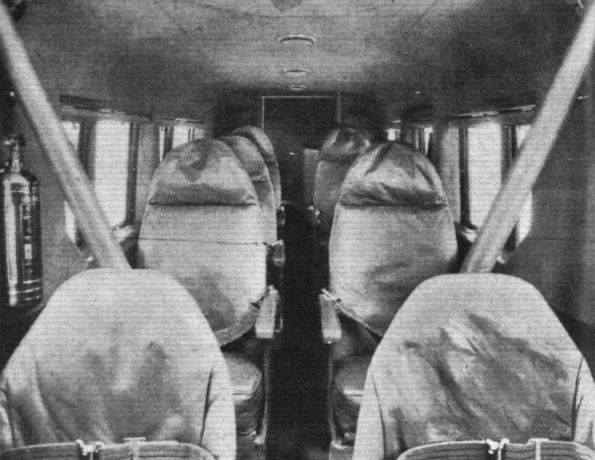 While primarily designed for passenger carrying, the "Kingbird," with a modified cabin interior, is ideal for several other types of service. Because of the reliability of its two-engined power plant, this ship is the logical one to use for photographic work, and also for mail and express carrying over regions in which a forced landing would be extremely hazardous. The cabin has been designed to give the utmost in comfort and convenience; the pilot sits forward on the left, with the auxiliary pilot or a passenger beside him. Since the control column is of the single-wheel type, which can be passed over from one pilot to the other, it is entirely out of the way of the person occupying the right-hand front seat. To make this seat available for a passenger, it is necessary only to disconnect the auxiliary pilot's rudder pedals. 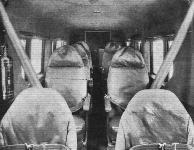 Behind the pilot's compartment are seats for six passengers, arranged in two rows with an aisle between. Further aft is a baggage compartment and a lavatory equipped with toilet and wash basin. The passengers' seats are reclining chairs artistically upholstered in leather, with high backs and luxurious box spring cushions, yet light in weight. The cabin has unusually large windows of non-shatterable glass, which give the passengers excellent vision. The walls are upholstered in leather up to the window, and line and cloth above. Trimmings are in walnut, and a carpet covers the floor. Ventilation and steam heating are provided. The walls are insulated against cold and noise by a special material installed between the upholstery and outer covering. The windows are fitted with sills roller shades. Drinking water is part of the equipment. In fact, everything has been done to give the passenger the atmosphere and comfort of a Pullman car. For maximum strength with light weight, the greater part of the "Kingbird's" structure is built of aluminium alloy, heat-treated steel being used for the more heavily stressed members. The wing spans are dural tubes in the inner panels and welded steel tube trusses in the outer panels. Wing ribs are built up of dural tubes, riveted together. The fuselage skeleton is constructed of dural tubes riveted into dural or steel fittings at the junction points. The tail surface skeletons are made up of spars and ribs stamped from sheets of alclad, the aluminium alloy material which resists corrosion. A vertical fin and rudder is placed in the slip stream of each propeller, giving directional stability and control under all conditions. The landing gear is designed to give very smooth landing and taxying characteristics. A rubber-tyred tail wheel is provided, and powerful oleo-and-spring shock absorbers are installed both on the main landing gear and on the tail wheel. Bendix brakes are used. The wings, fuselage and tail surfaces are covered with highest quality fabric. The engine nacelles are covered with removable dural cowling, giving easy accessibility to all parts of the power plant installation. As in the case with all Curtiss ships, the strength of every detail of the structure has been most carefully checked by stress analysis supplemented by static tests. The "Kingbird" is completely equipped for night flying, having landing lights retractable into the fuselage cowling, navigating lights, instrument board lights and dome lights in the cabin. The comfortable reclining chairs protect the passengers against fatigue on this type of service. The important control system has been given most careful consideration. A side-by-side dual system is used, the rudders being actuated by pedals and the ailerons and elevators by a single flop-type wheel, which is always entirely clear of the front seat not being used by the pilot at the controls. The elevators are worked by push-rods, the rudder by cables, and the ailerons by cables running up to the wings and connecting there with push-rods. The ailerons and rudders are balanced aerodynamically so as to give light loads on the controls. We understand that the "Kingbird" can be fitted with the Wright J-6 nine-cylinder engines (375 h.p. ), with a resulting increased performance. For instance, the maximum speed is increased to 160 m.p.h. and the climb to 1,600 ft. per minute. The service ceiling in this case is 21,000 ft and the absolute ceiling 22,500 ft. The Curtiss "Kingbird": An American 8-place twin-engined cabin monoplane, fitted with two 225 h.p. Wright "Whirlwind" engines. Kingbird не пользовался спросом на рынке гражданских самолетов отчасти из-за экономического кризиса 1930-х годов, и его карьера получилась сравнительно недолгой. На снимке: третий построенный самолет. An internal view of the cabin of the Curtiss "Kingbird." There are six comfortably-upholstered chairs, three a side with a gangway in between.